Another 4th of July is upon us! 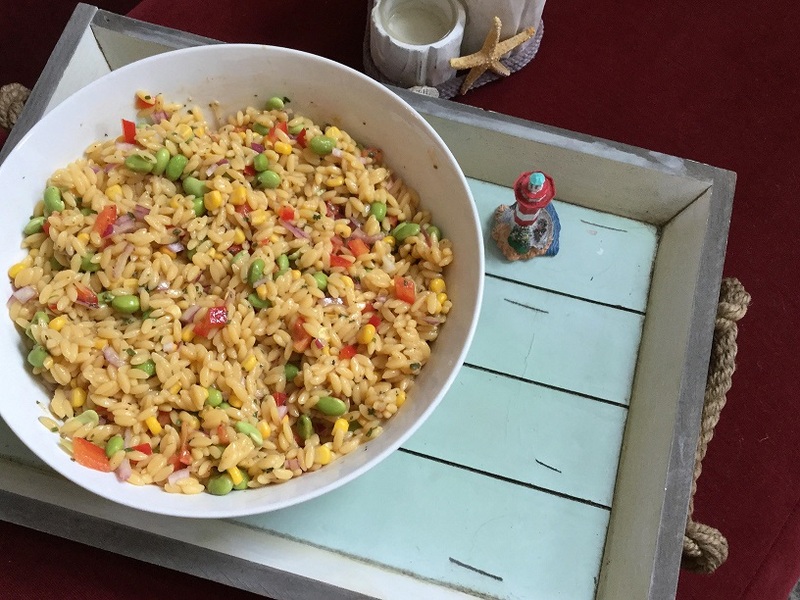 One of my favorite ways to stay “cause” over the picnics, BBQ’s and firework parties is to make and take an Orzo Salad which everyone will taste, love and…not even miss the rancid, fatty oil. You will have your starch (satiety) and probably only need a green salad to be content, social and NOT “effect”! It is a small labor of love. Enjoy the day of freedom! Cook pasta according to package, RINSE in cold water, place veggies, pasta, half spice/half sauce mix in a bowl, mix then cover and place in fridge for 1 hour. NOTE: Pasta will drink in ALL the flavours of the veggies, and seasoned sauce. After pasta is completely cooled in the fridge for one hour (at least) add the rest of the sauce/spice mix to the pasta and gently toss. If for some reason the sauce has soaked up even more, make another batch of sauce. You can always use excess on a green salad. NOTE: All pasta is made differently. You’re adding water into something that HAD water then was dried, so the amount of water or fluid needed will change. ALSO, realize you aren’t using OIL, which is fat, rancid and gross. So you may need more vinegar, etc. don’t worry about it, the taste will make you not even get the idea that there’s no oil. The ORZO measurements are for typically 12 oz. If you actually find a 16 oz., well you’ve got the gold, but if 8 oz. get 2 packages and just measure a 1/2 cup more of the second package. You can always adjust the seasonings or double your sauce. Garnish with green onion, more parsley, a dash of oregano and basil!